The Texas Music Pioneers Exhibit of the Texas Music Museum features over sixty Texas musicians in fourteen musical genres. 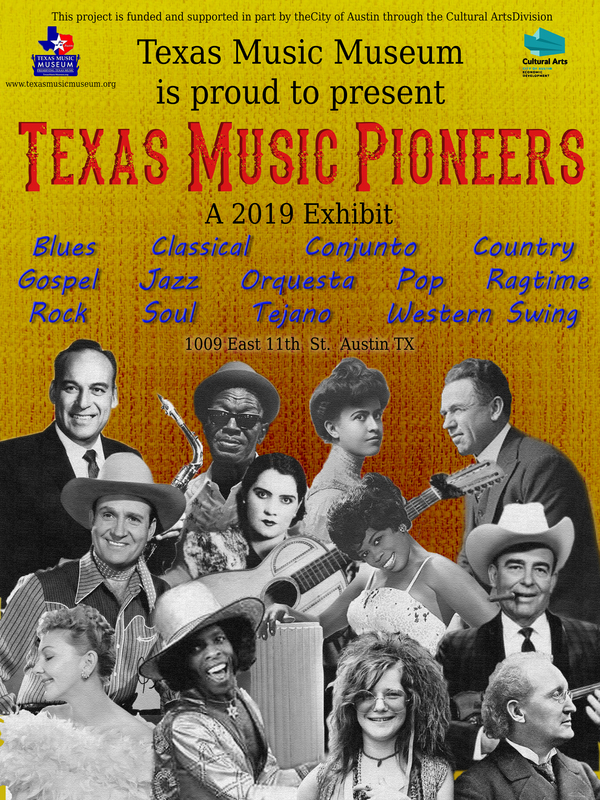 Learn about several of the earliest Texas musicians to contribute to the development of each the following categories of music: Blues, Classical, Conjunto, Country, Cowboy/Cowgirl, Gospel, Jazz, Orquesta, Pop, Ragtime, Rock, Soul, Tejano Vocalists, and Western Swing. Displays include information about each musical genre, artists’ biographical information, artist memorabilia, antique recording cylinders and 78 rpm records, antique phonographs, radios and sheet music from Texas’ two earliest publishers, and QR codes that connect to online recordings which enable visitors to enjoy these musicians’ unique sounds. Texas Music Museum is a non-profit, all volunteer museum. We hope to meet you when you visit the Texas Music Museum. Admission is free, donations are appreciated. ADOLPH FUCHS (1805-1888) from Germany, brought a variety of choral and instrumental music, both sacred and secular. Pastor Fuchs was a pioneer music educator in Texas, beginning in 1847, as well as being a prolific composer whose works include an Opera In Two Worlds. FRANK VAN DER STUCKEN (1858-1929) was the earliest Texas – born Classical composer of international renown. He began his Classical training in Belgium, and from the mid-19th through early 20th century, enjoyed an illustrious career as conductor of several prominent Symphony Orchestras in the U.S. and Europe. HANS KREISEG (1860-1929), Classical pianist, composer and Operatic symphony conductor, founded the Dallas Symphony Club in 1900, which evolved into the Dallas Symphony. CARL VENTH, (1860-1938) formed the Fort Worth Symphony Orchestra, was its first conductor, and also served as one of the early Music Directors of the Dallas Symphony Orchestra from 1911-1914. JOHN STEINFELDT, (1864-1946) choral composer, concert pianist, renowned organist, and music educator, resided in San Antonio most of his life. He recorded two of his compositions on Ampico Corporation Reproducing piano rolls: Chanson D’ Amour (Song of Love) in 1911 and The Fountain in 1914. OLGA SAMAROFF (1880-1948), born in San Antonio, was a world-renowned virtuoso pianist who debuted at Carnegie Hall in 1905, and subsequently performed nationally and internationally. She recorded dozens of Reproducing Piano rolls, beginning in 1908 for Ampico and Welte Mignon Corporations, and then records for Victor Talking Machines. RAFAELO DIAZ (1883-1943), from San Antonio, was the first Texan to become a star of the New Yok Metropolitan Opera Company by performing leading Tenor roles there from 1917-1936. He was a pupil of Vincento Sabatini, famous Opera maestro. DREDA AVES (1894-1942), a dramatic Soprano, was raised in Galveston and made her debut in 1928 in Aida at the New York Metropolitan Opera Company, where she continued as a leading Soprano for eight years. She later performed and toured with the San Carlo Opera Company. RUTH BINGAMAN (SMITH) 1894-1996, a distinguished Classical pianist who grew up San Antonio, made her debut with the San Antonio Symphony in 1906 and her Carnegie Hall Debut in 1921. She was the featured recording artist for De Luxe Reproducing Piano Roll Corporation in New York City in the 1920’s and 1930’s. ROY ORBISON 1936-1988, who grew up in Vernon, Texas first hits were Popular Rockabilly songs in the 1950s. He pioneered a dramatic and enduring style of ballads beginning in the 1960s, with his smooth voice distinguished by an unusual three-octave vocal range, accompanied by stylistic beats. BUDDY HOLLY (1936-1959), from Lubbock, Texas was the leader of one of the first white Rock and roll bands to utilize the rhythm and Blues format of lead guitar, rhythm guitar, bass and drums in the mid 1950’s. JANICE JOPLIN (1943-1970) from Port Arthur, Texas used her powerful vocal intensity, amazing range, and awesome wails to create a groundbreaking style, and timeless Popular recordings. She is often characterized as an icon of 1960s liberated counter culture. ROKY ERICKSON (1947- ) & 13TH FLOOR ELEVATOR, founded in Austin, was the first nationally recognized psychedelic band, preceding by at least a full year before the 1967 “Summer of Love” which resulted in a deluge of psychedelic bands. MARY CARSON (1880’s-1951), born in Millican, Texas was the first Texan to make a sound recording on cylinders with Edison Records in 1913. She later also recorded on Edison Diamond disks. JULES BLEDSOE (1898-1943), born in Waco, Texas was a baritone who starred in musicals in theaters and on films. He was the first to sing Ol’ Man River in Zigfield’s production of “Showboat”. GENE AUSTIN (1900-1972), from Gainesville, Texas was one of the most popular Pop vocalists in the 1920s and 30’s with over 50 hits. His recordings of My Blue Heaven, Ramona and others have become timeless favorites. MARY MARTIN (1913-1990), from Weatherford, Texas was one of Broadway’s greatest performers in the 1940s and 50s. Many songs she performed in musical theater and in films, such as “Peter Pan” and “South Pacific”, have become classics. THOS. GOGGAN AND BRO. 1866 – 1930s, was founded by Thomas Goggan, an Irish immigrant, with Goggan’s first store and publishing center in Galveston. HAUSCHILD MUSIC CO. 1891 – 1922, located in Victoria, Texas was established by George Hermann Hauschild, a German immigrant. SCOTT JOPLIN (1867-1917), from Texarkana, is the most well-known and Popular composer of Ragtime music. His biggest and enduringly Popular compositions are The Maple Leaf Rag and The Entertainer. He also composed the Ragtime Opera Treemonisha. EUDAY BOWMAN (1886-1949), from Fort Worth, most Popular composition was Twelfth Street Rag, which has a unique combination of a repeating three-note melody. It has been credited with helping to rekindle interest in Ragtime music. JOE TEX (1933-1982) born in Baytown, Texas was a successful singer/ songwriter who began his career at the Apollo Theater in New York. His Soul sound was influenced heavily by Gospel, Rhythm & Blues, and Country music. ESTHER PHILLIPS (1935-1984) from Galveston, produced top national hit records in Soul, and other genres from the late 1940s through the 1970’s. SLY (1943- ) AND THE FAMILY STONE began recording in the late 1960’s and was formed by Sly, (from Dallas). The group continued recording another twenty years, although Sly made his first recording when he was four years old. ARCHIE BELL (1944- ) from Houston, formed the Drells while in high school, and their 1967 hit Tighten Up lead to Bell’s stardom, and his continued popularity. His most recent recording was released in 2014. BETO VILLA (1915-1986), a saxophonist from Falfurrias, Texas, in 1940 was the first to record Orquesta music and is considered the Father of Orquesta Tejano. BALDE GONZALEZ (1928-1974) was raised in Beeville and attended the State School for the Blind in Austin. He was a Popular Orquesta leader who was influential from 1945-1956. ISIDRO LOPEZ (1933-2004) born in Bishop, Texas was an accomplished singer, saxophonist and bandleader, considered to be the major innovator of Orquesta Tejano, referred to after the 1960s as the Tex-Mex sound. PEDRO AYALA (EL MONARCA DEL ACORDEON- The Monarch [i.e. King] of the Accordion) (1911-1990), from Nueva Leon, Mexico, immigrated to the US and entertained in Texas and the Southwest beginning in the 1930s – 70s, and became a Popular recording artist. SANTIAGO JIMENEZ, SR. (1913-1984), accordionist from San Antonio, was the innovator of adding the tololoche, a Tejano contrabass (low pitched Folk instrument similar to a string standup bass) that became commonly used in Conjunto music in the 1940s. EVA GARZA (1917-1966), born in San Antonio became known as “The Sweetheart of the Americas” because of her international Popularity from recording, touring, and national and international radio programming. CHELO SILVA (1922-1988) was born in Brownsville, and became known as “La Riena de los Boleros” (The Queen of Boleros). She was an international star in the U.S., Mexico and South American. CARMEN MARROQUIN (1921-2010) and LAURA CANTU (19262004), from Kingsville, Texas were Texas’ first female Texas Mexican Americans duet recording artists who in 1946 helped launch the Ideal Record company, started by Carmen’s husband Armando. Carmen and Laura’s performances with Narcisco Martínez, recognized as The Father of Texas-Mexican Conjunto, helped popularize the Conjunto genre. SEGER ELLIS (1904-2014) from Houston was a bandleader/singer/ musician and one of the most Popular Jazz keyboard artists of the 1930s. JACK TEAGARDEN (1905-1964) from Vernon, Texas was one of the best early Jazz trombone players and singers, making his first recording in 1927. All of his siblings also became prominent musicians. MILT LARKIN (1910-1996), from Navasota, Texas became a prominent Jazz trumpeter and bandleader in the 1930’s and 40’s. His Popular band toured the Country, including regular performances at the Apollo Theater and the Celebrity Club in New York. TEDDY WILSON (1912-1986) from Austin, was an acoustic Jazz pianist who in the 1930’s toured with Benny Goodman and Gene Krupa in one of the first integrated groups to perform in the United States. He formed one of the most prominent Big Bands of the 1940s. CHARLIE CHRISTIAN (1916-1942) was born in Bonham, Texas and was one of the pioneering Jazz electric guitar musicians. He was known for his unique picking techniques and was a highly regarded guitarist. ARNET COBB (1918-1989) from Houston was a Jazz composer, arranger, and Tenor saxophonist who began his career in the Milt Larkin band. He toured extensively in the U.S., Europe and Japan. ORNET COLEMAN (1930-2015) born in Fort Worth, was a highly respected innovator of Improvisation Jazz as a saxophonist, violinist, trumpeter and composer. AL DEXTER (1902-1948) was born in Jacksonville, Texas and his 1936composition Honky-Tonk Blues was first Country song to use term “Honky-Tonk”. His most famous recording was Pistol Packin’ Mama. STUART HAMBLEN (1908-1989) from Kellyville, Texas was a singer/songwriter/bandleader. His composition of This Old House, It’s No Secret (What God Can Do) and others have become standards. ERNEST TUBB (1914-1984) was born in Crisp, Texas and beginning in1941, personified the Folksy and rowdy Country music, known as Texas honky-tonk with electric amplification of instruments which increased the Popularity of honky-tonk record sales. CARL T. SPRAGUE (1895-1979 was born in Brazoria County, Texas, and in 1925 recorded the first Cowboy song to achieve hit status, When the Works All done This Fall, and was the first artist to market himself in the image of a singing Cowboy, complete with chaps, hat, and guitar. LOUISE MASSEY (1902-1983) AND THE WESTERNERS, Louise was from Midland, Texas and labeled the “Original Rhinestone Cowgirl” known for her spectacular costumes and for recording in English and Spanish during her career spanning 1918 – 1950. TEX RITTER (1906-1974), of Panola County Texas, a singer, songwriter and actor, starred in 78 movies as a singing Cowboy, and a successful recording artist. GENE AUTRY (1907-1998), was born in Tiago, Texas and in 1941, was the first movie star billed as a “Singing Cowboy”; was the first film actor to become a Cowboy TV star; and in 1949 he released the first country western record to go platinum. BILL BOYD (1910-1967) AND THE COWBOY RAMBLERS of Fannin County, Texas began recording in 1934, remained a string band (no brass instruments like many bands of that era) and became influential recording musicians with songs that became Country standards. MILTON BROWN (1903-1936) born in Fort Worth, was a band leader and vocalist who co-founded the genre of Western Swing. His band was the first to fuse hillbilly, Jazz, and Pop together into a unique, distinctly American hybrid, thus giving him the nickname, Father of Western Swing. BOB WILLS (1905-1975) from Koss, Texas was a musician, songwriter, bandleader and the co-founder, with Milton Brown, of Western Swing. He became widely known as the King of Western Swing. CLIFF BRUNER (1915-2000) born in Texas City, was a fiddler and early Western Swing bandleader who combined elements of traditional string band music, improvisation, Blues, Folk, and Pop. THE LIGHT CRUST DOUGHBOYS band performed from 1931-early 2000s, achieved its peak of Popularity in the years leading up to World War II, and launched the careers of Western Swing pioneers Bob Wills and Milton Brown. WASHINGTON PHILLIPS (1880-1954), from Freestone County, Texas pioneered a unique sound of Gospel music with his solo Tenor voice, as he accompanied himself on a homemade harp-like instrument. Although he recorded for Columbia only from1927-1929, his style influenced the next generation of African American vocalists. ARIZONA DRANES (1894-1954), from Houston, graduated from the School for the Blind in Austin. She was one of the first female singers and pianists to become a major influence on the early Gospel performers through her electrifying live appearances. She released sixteen recordings released June 1926 and 1928. BLIND WILLIE JOHNSON (1897-1945), raised in Marlin, Texas composed and recorded Gospel music from 1927 – 1930. He was said to make religious songs sound like the Blues, and give religious feelings to his secular songs. Let Your Light from the Lighthouse Shine on Me was one of his major classic recordings. R. HARRIS (1916-2000 and THE SOUL STIRRERS began changing the sound of male Gospel quartets in the 1930s, in ways that have influenced quartets since that time, and this style also influenced the sound of quartets that perform rhythm & Blues, Soul and Pop music. BLIND LEMON JEFFERSON (1893-1929) of Freestone County, Texas, was the first Folk-Blues singer/guitarist to attain a national audience with the 1926 release of his first recording. SIPPIE WALLACE (1898-1986) born in Houston, was the earliest nationally recognized female Blues singer/songwriter, whose first Popular recording was released in 1924. She was the sister of Hersel and George Thomas. VICTORIA SPIVEY (1906-1976) of Houston was the second earliest nationally recognized female Blues singer/songwriter, whose first Popular recording was released in 1929. THOMAS BROTHERS – HERSHEL (1910-1926) and GEORGE (1883-1930) were born in Houston, and both were both Blues pianists and songwriters. George wrote and co-wrote with Hershel, several influential early boogie-woogie piano pieces, and they recorded a number of sides for Okeh Records. BONE WALKER (1910-1975) born in Linden, Texas and in 1935 was the first Blues guitarist to perform on an electric guitar. He inspired numerous electric guitar Blues artists which include Eric Clapton and Bonnie Raitt. LIGHTNIN’ HOPKINS (1911-1982) born in Centerville, Texas was an early Blues singer, songwriter, and guitarist who recorded more than 85 albums from 1946-1970. His distinctive playing techniques included tapping his guitar to add beats to accompany his playing.